cv.jit is a collection of max/msp/jitter tools for computer vision applications. The goals of this project are to provide externals and abstractions to assist users in tasks such as image segmentation, shape and gesture recognition, motion tracking, etc. as well as to provide educational tools that outline the basics of computer vision techniques. Calculates the mean value of a matrix over time. Calculates the running average of a matrix over time. Sums all the pixels in a plane, works for any type/dim. Estimates the variance of a matrix over time. Estimates the standard deviation of a matrix over time. Estimates the optical flow using various algorithms. Estimates the optical flow using the Lucas-Kanade technique. Estimates the optical flow using the Horn-Schunk technique. Track the position of up to 255 individual pixels. Initialize cv.jit.track to easiest pixels to track. Region tracking using the MeanShift and CAMShift algorithms. Extract binary edges from a greyscale image. Turns a pixel ON if at least one neighbour is ON. Removes the edge pixels from an image. Isolates a single connected component. Gives each connected component a unique value. Find bounding boxes for each connected component. Find center of mass for each connected component. Find direction each connected component points to. Calculate elongation for each connected component. Calculate moments of inertia for each connected component. Measure angle of main axis for each connected component. Carry out pattern recognition on each connected components. Re-arrange labels so that each connected component keeps the same from frame to frame. Returns the number of non-zero pixels. Calculates the center of mass for an image. Computes various invariant shape descriptors. Calculates a shape’s main axis. Calculates the direction a shape points to. Counts the number of edge pixels. Estimates how thin a shape is. Estimates how compact a shape is. Performs pattern analyis and recognition on an incoming list. Finds human faces in an image. 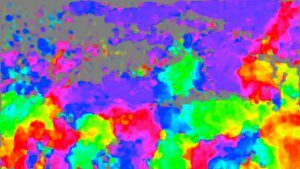 Finds areas of high contrast, pixels that are easy to track. Find straight lines in Hough space. Fit a point sequence to image edges. Change the type of a matrix without changing other attributes. Treats the data in two matrices as cartesian coordinates and translates to polar data. Display optical flow using hue and saturation. Computes the covariance matrix of a vector. Calculates the harmonic mean over time. Calculates the geometric mean over time. The latest version of cv.jit is 1.8 and can be used with 64-bit versions of Max. A big thanks to the good folks at Cycling ’74 for porting the externals. Download cv.jit version 1.7.2. for OSX (Universal Binary). Download cv.jit version 1.6.2 for OSX (Universal Binary). Download cv.jit version 1.6.2 for Windows. Download cv.jit for OS 9.
cv.jit is distributed according to the LGPL license. This means that you can freely use these externals as part of a Max patch. Download the development files for the 64-bit port, including source and project files. Requires jitter, available from Cycling ’74.